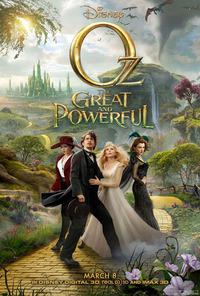 Working as a prequel to MGM’s The Wizard of Oz (1939), Disney’s Oz: The Great and Powerful regales the journey of carnival magician Oscar “Oz” Diggs (James Franco), a showman of the shabbiest order, towards the curtain behind which he’ll have to forever hide. Oz himself is unable to extricate himself from the dream that his performances to a poverty-stricken monochrome Kansas town have begun to build. He undervalues the real people in his life, preferring a fantasy where he is venerated as great and powerful and his backwater buddies need never figure. Promptly tangled up in a tornado, he finds himself in a bizarrely colourful 3D movie dream world named after himself. Here it is prophesied that a great and powerful wizard named Oz will defeat the Wicked Witch and reign as king of the Emerald City. There are riches involved, and he was always rather good at pulling off a con, so the jackass sets off to seem the wizard. He thereupon meets a motley crew - the pretty good witch Theodora (Mila Kunis), a winged monkey in a bellhop uniform (Zack Braff), and a young girl made of china called China Girl (Joey King) - and discovers that not being in Kansas anymore sure can teach him a lesson or two. This is a very assured film that works most effectively as homage to the pleasures offered by the 1939 film. It’s Raimi’s first foray into 3D, and his careening camera delights in swerving through an environment realised by MGM seventy four years ago. The use of 3D is perhaps most interesting in the colour-drained opening, displayed in academy ratio. While many viewers are by now familiar with stereoscopic, computer-generated expanses, watching boxed-in 3D black and white is a more uncanny experience. It is here, as monochrome stars move about in depth, where there is most markedly the impression of a dream taking form. Tonally, Raimi is a perfect fit for the material (mostly lacking, as it does, a songbook). His wicked sense of humour is at play here, gleeful but never so knowingly hip as to detract from steadfastly old-fashioned goings on. People may talk big but they aren’t above showing some heart. The often-miscast Franco works well in this regard as an out-of-place buffoon, blundering about on sheer braggadocio (so much so that the film can read as a loose remake of Raimi’s Army of Darkness , where a Michigan blowhard found himself in a hammy king’s court). He effectively nuances the character in later scenes, as the film begins to explore the damaging and great power that dreams can hold over the dreamer. It is the women who carry out the majority of the film’s heavy lifting, however. Kunis, Michelle Williams and Rachel Weisz all excel in a wyrdly retrograde triumvirate. Weisz, given the least interesting role, still chews on the scenery as if it were made of something more than pixels. Williams performs Goodness disingenuously without sacrificing interest. Kunis is effective in the film’s most problematic role, showing that Hell hath no fury like a stereotype scorned. The film is also a mite long, and could be criticised for a lack of urgency. This same criticism, if leveled against The Wizard of Oz, would seem silly and beside the point - it is a musical after all. Raimi’s excuse seems that he’s simply having too much fun, and it’s hard to begrudge him that. This is a grand family film - sometimes funny, sometimes scary, often human. It is a work of and about imagination, lending something resembling joy back to computer-generated imagery along the way. It’s fantasy, false and true. This review was published on March 11, 2013.